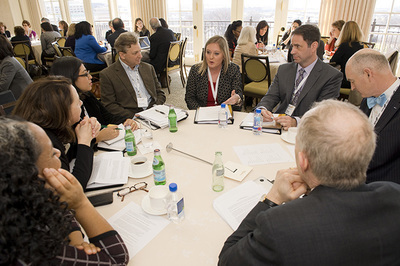 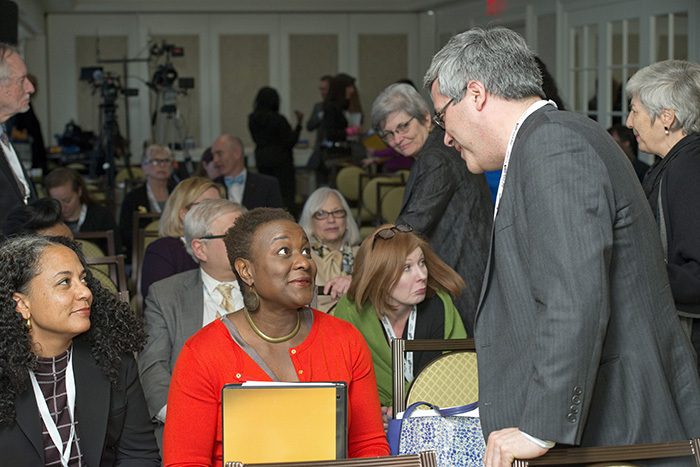 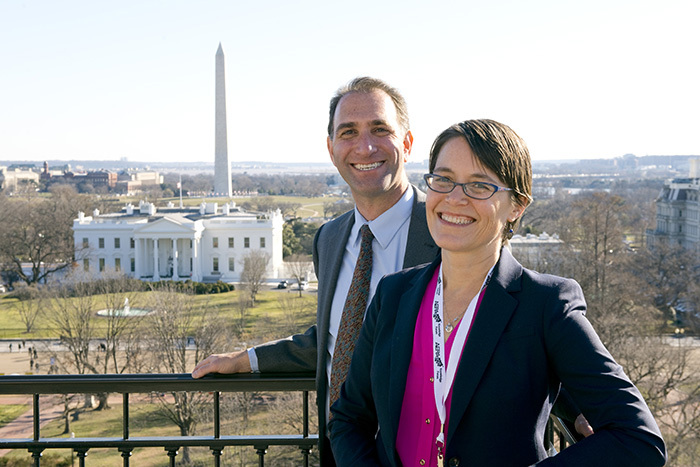 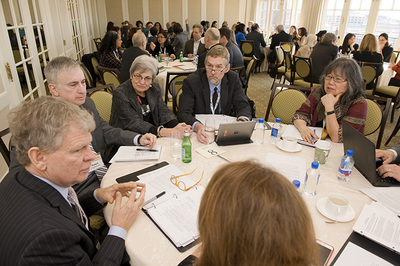 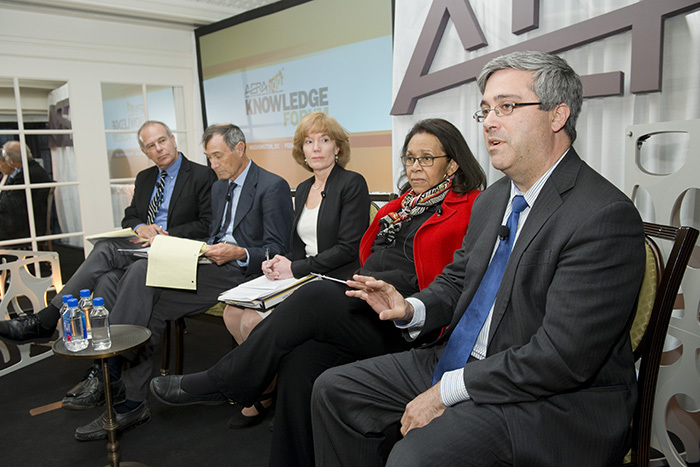 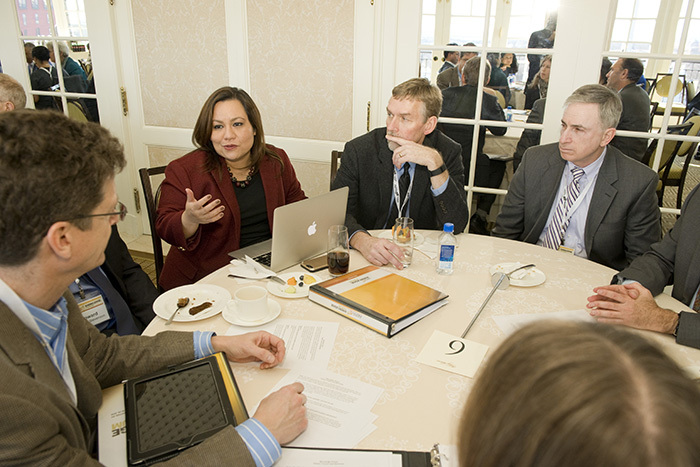 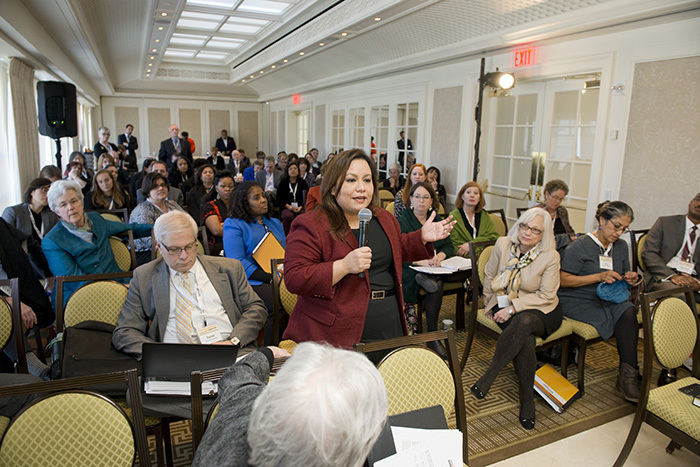 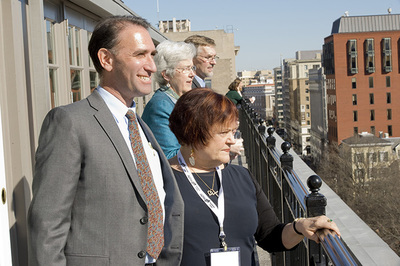 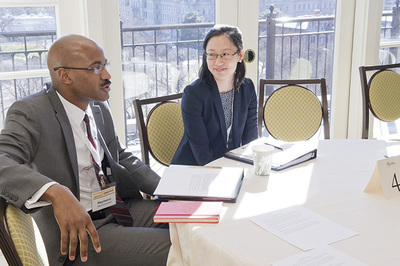 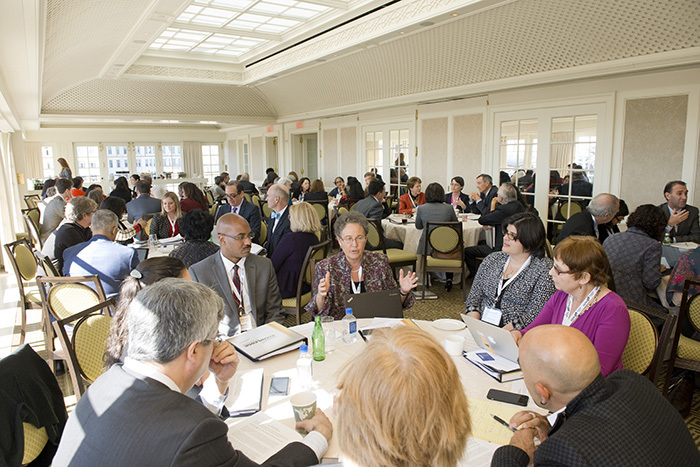 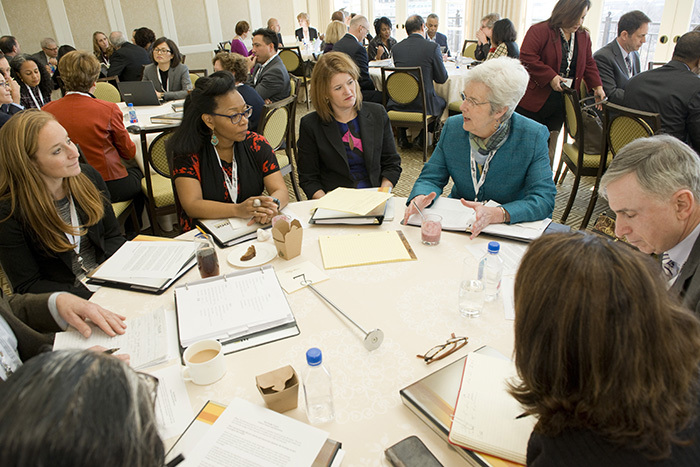 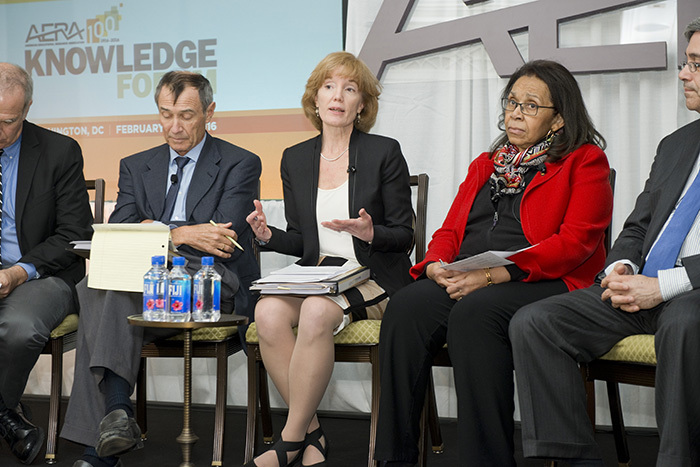 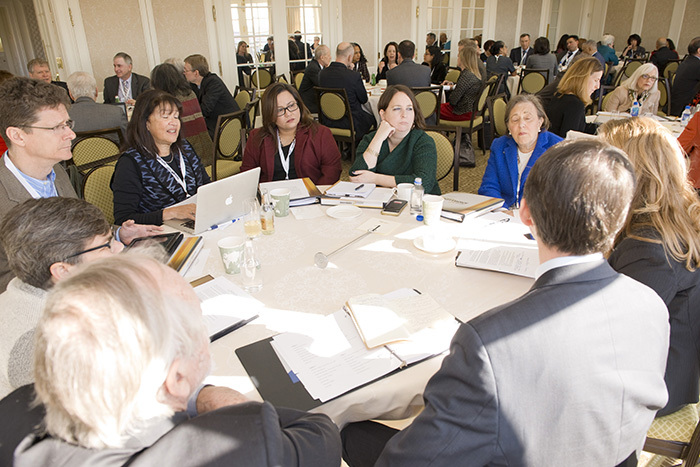 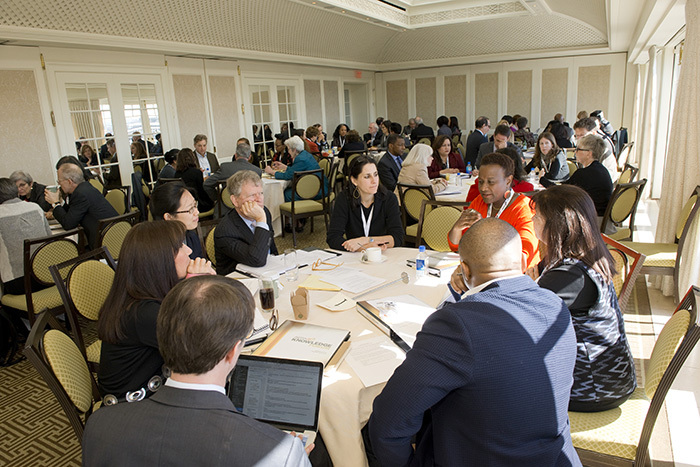 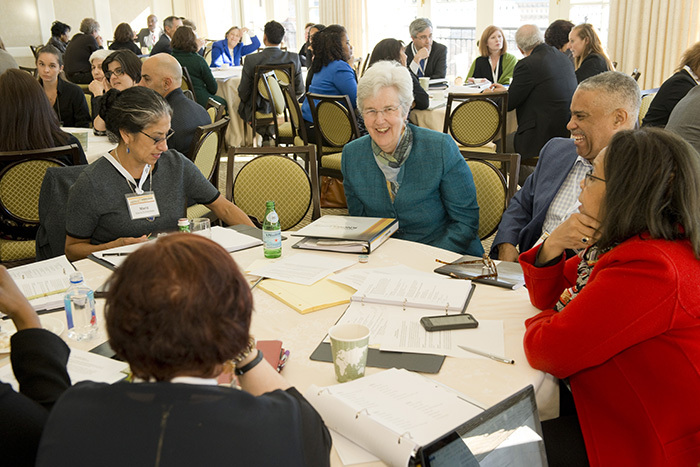 The February Forum Ed-Talks took place on February 18, 2016, in Washington, D.C. and featured 13 of the rapid-fire Ed-Talks on significant research clustered around three themes—how people learn, how we can optimize learning, and how we can foster equitable outcomes. 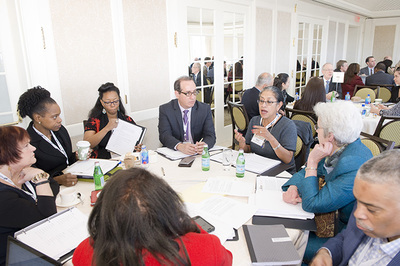 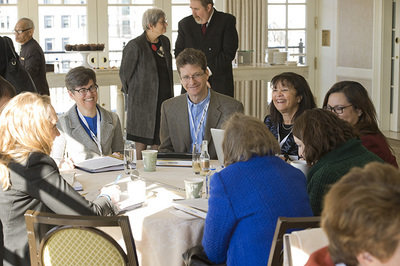 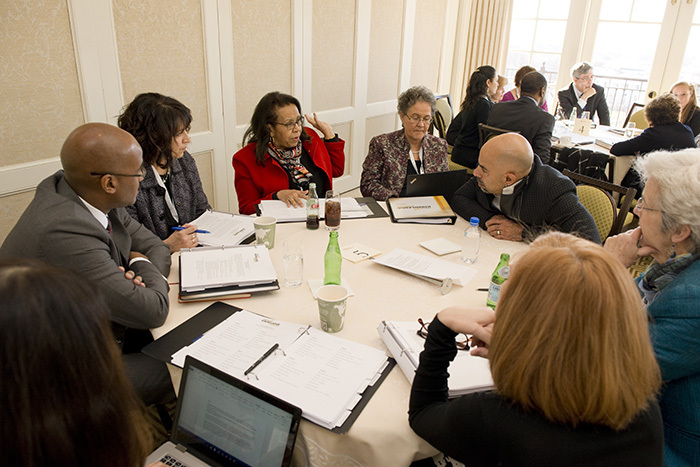 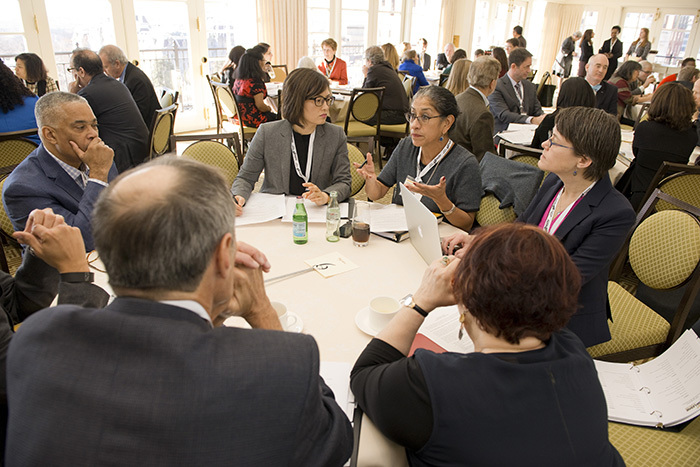 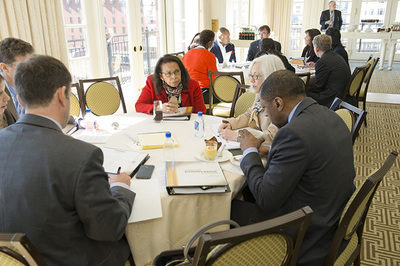 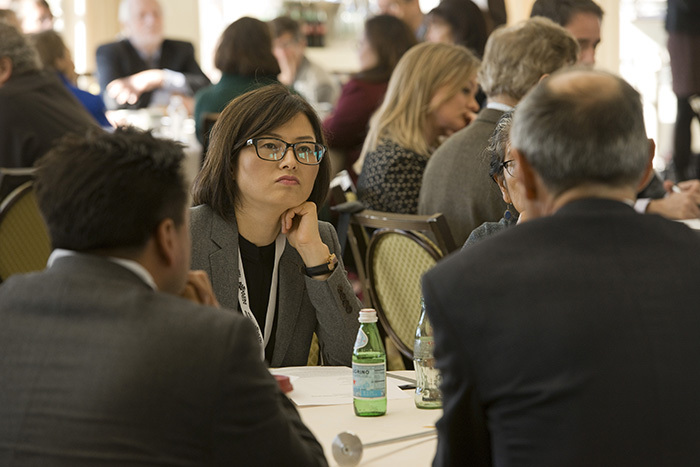 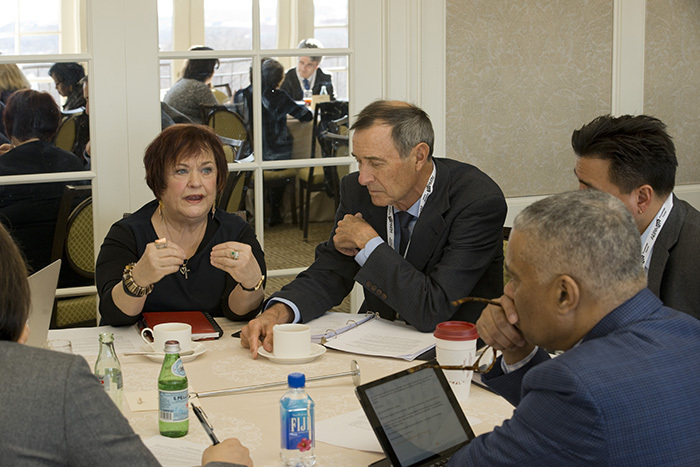 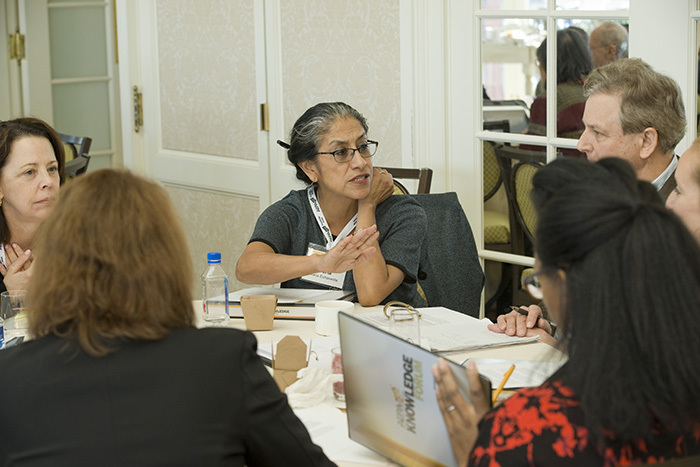 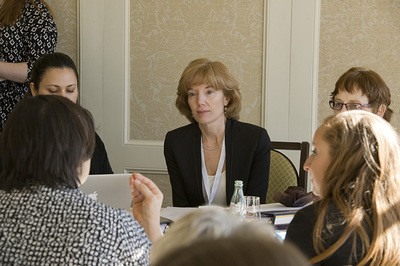 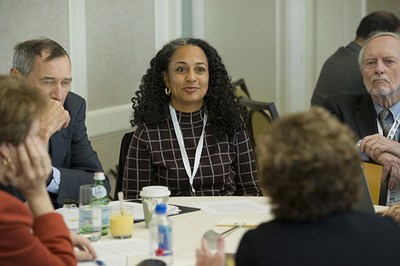 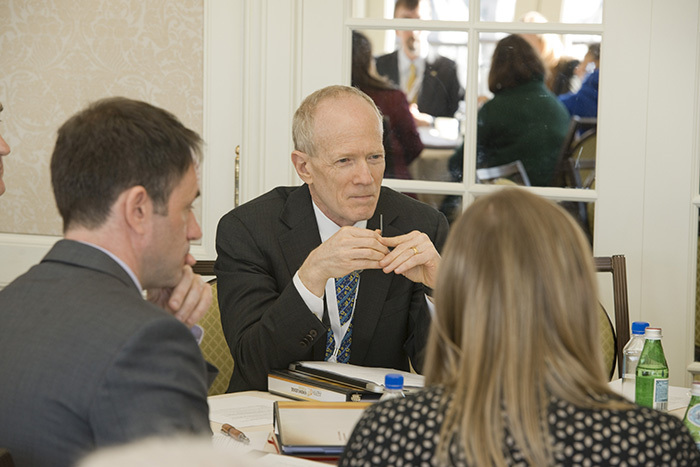 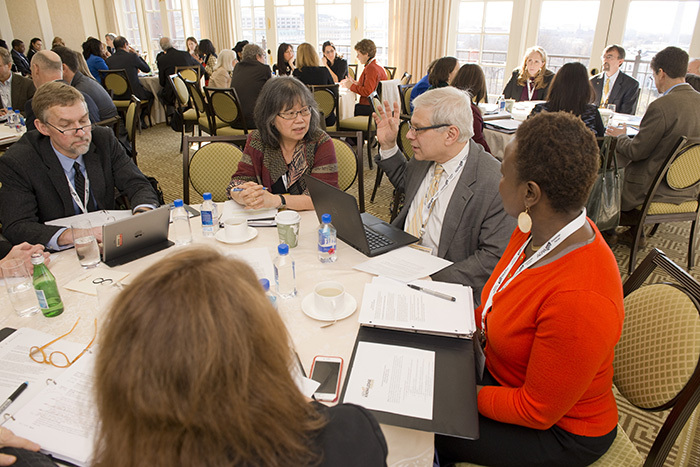 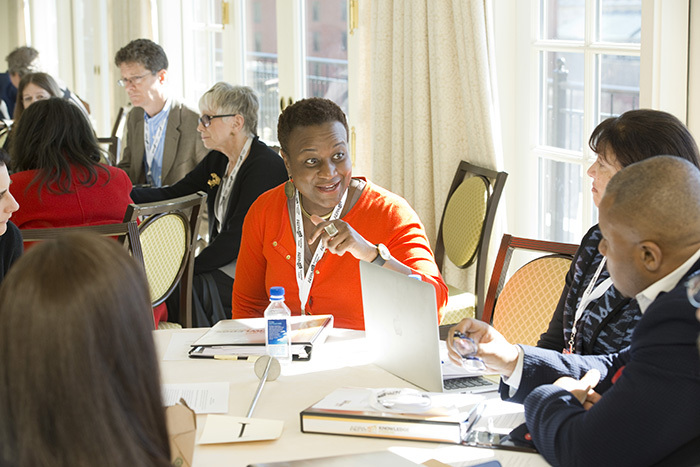 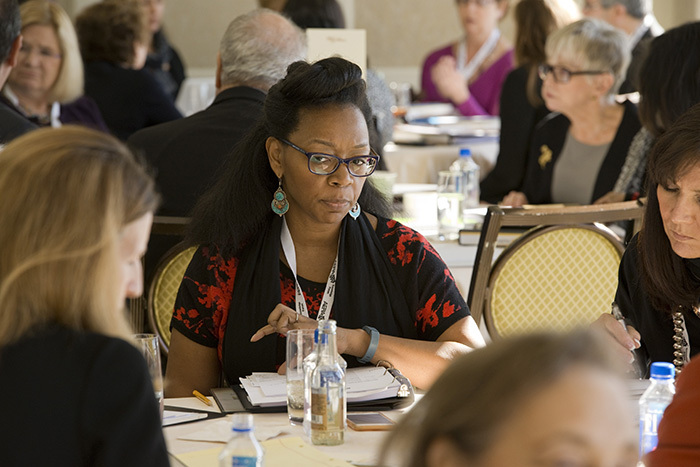 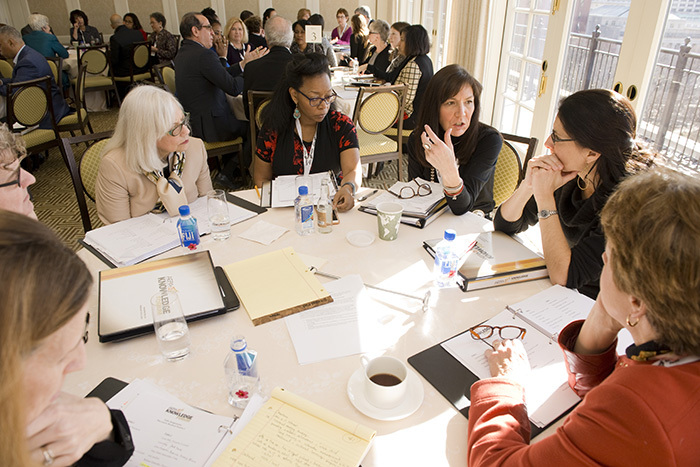 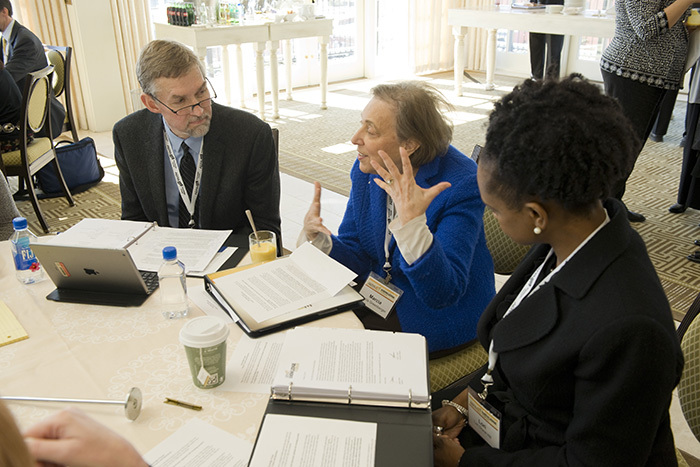 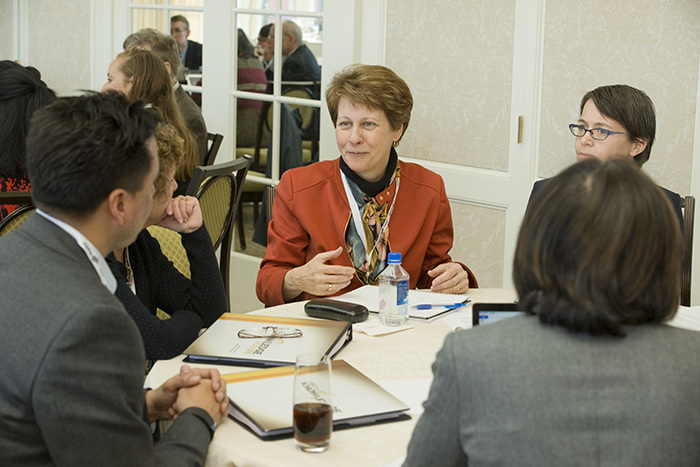 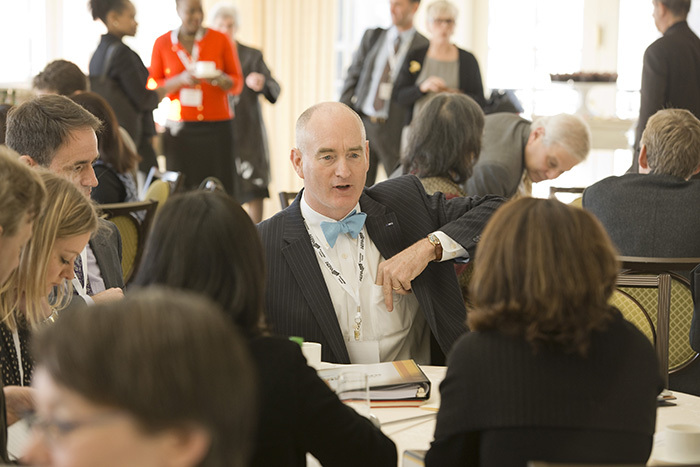 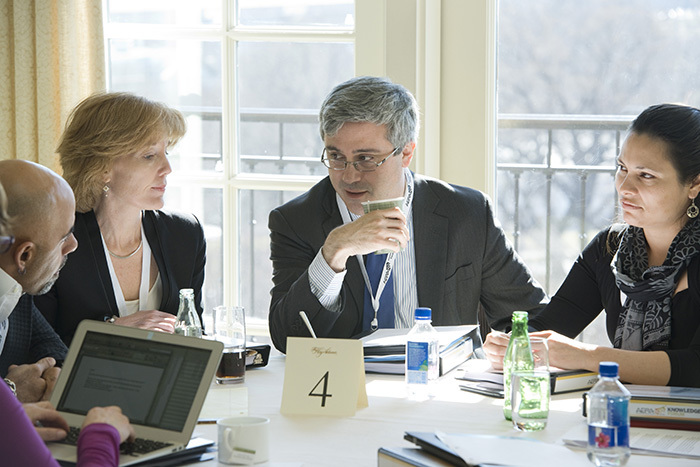 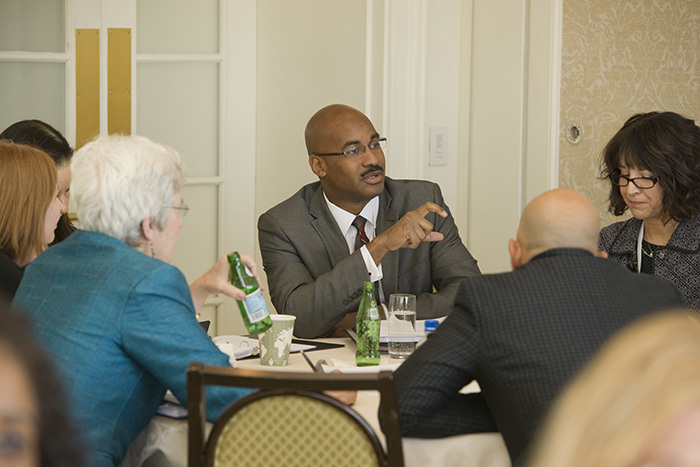 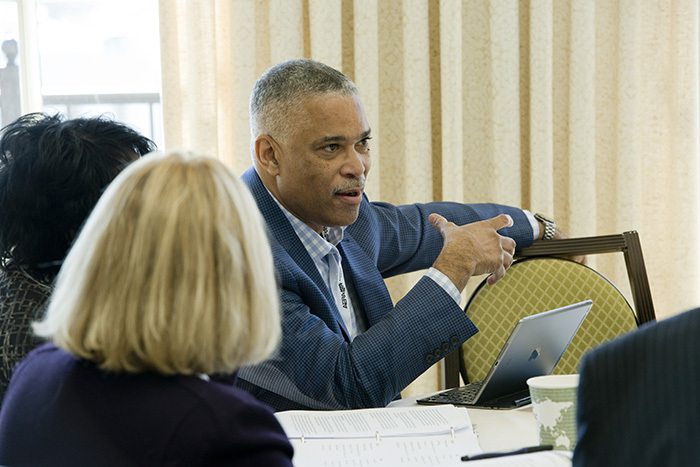 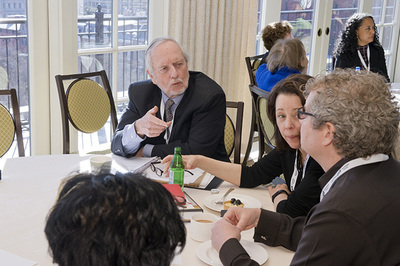 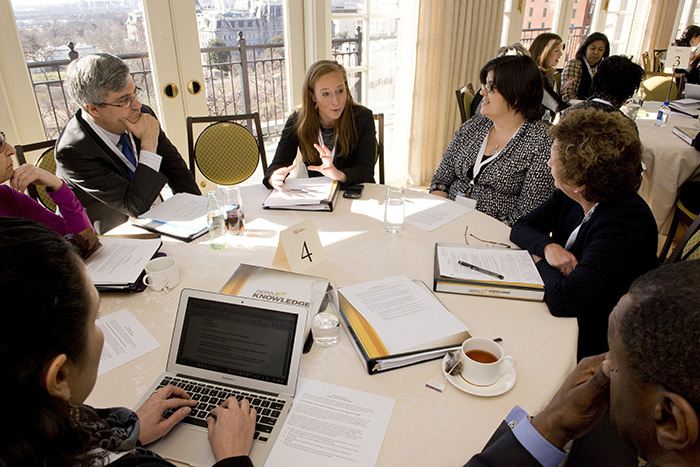 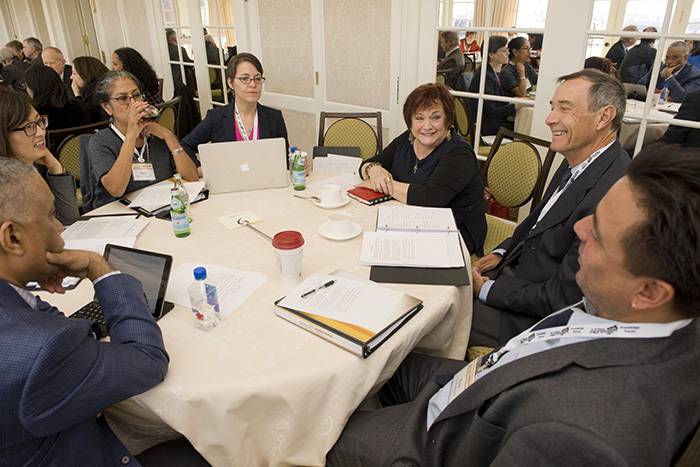 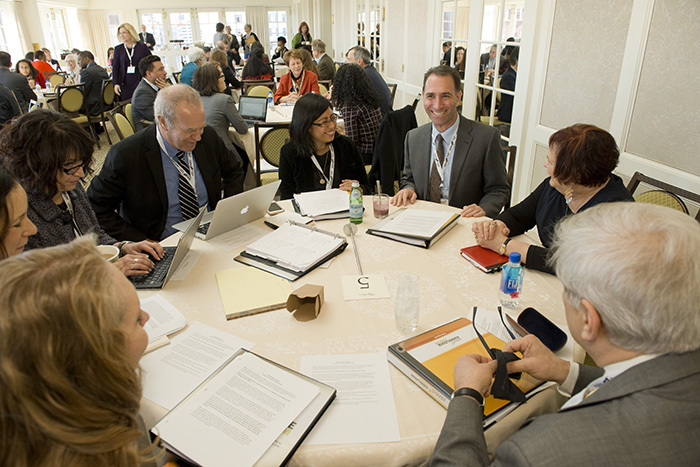 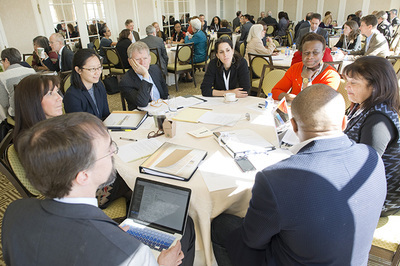 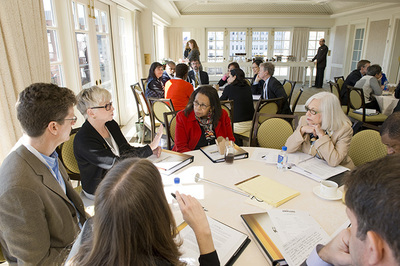 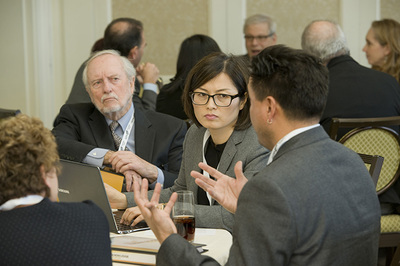 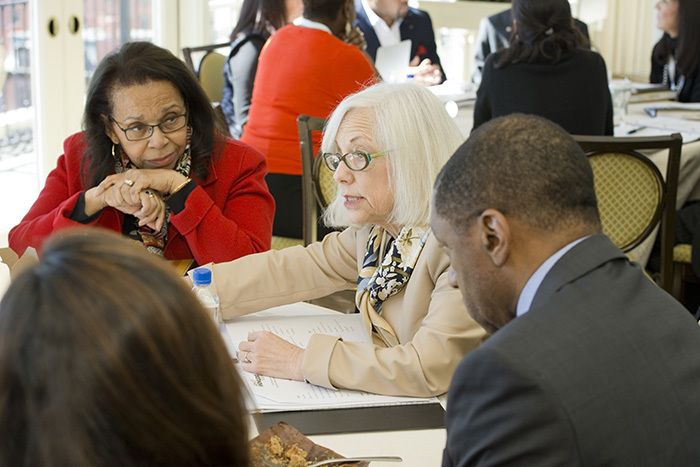 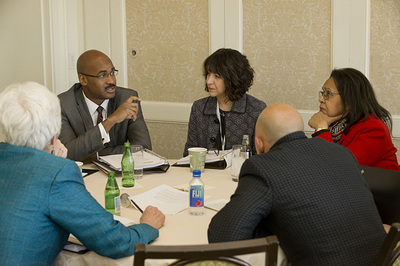 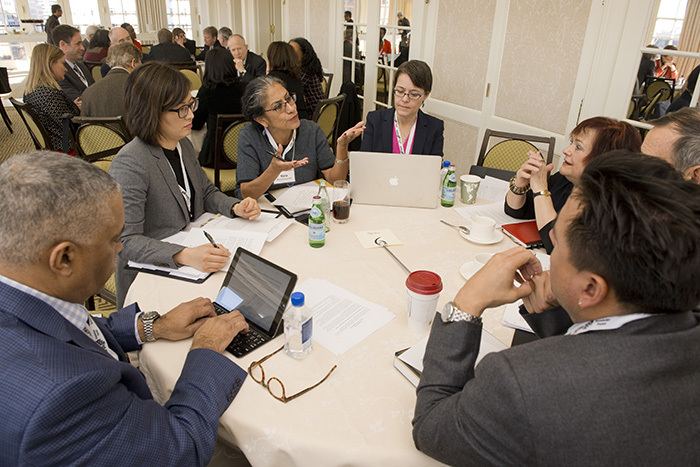 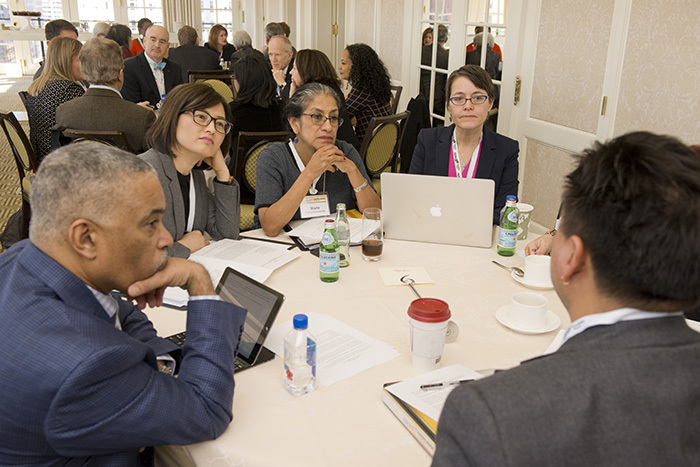 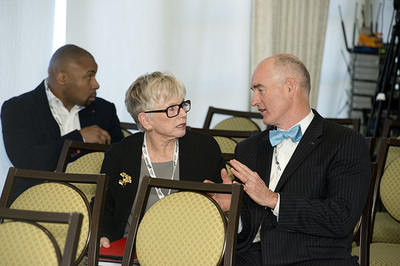 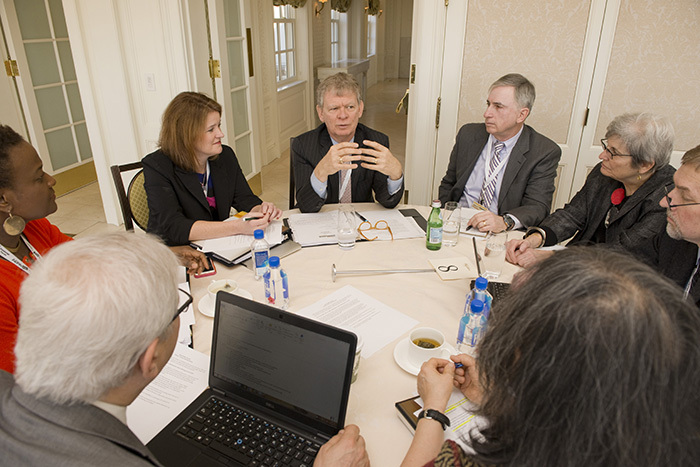 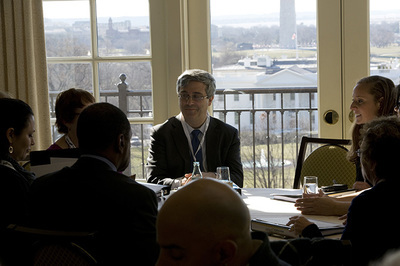 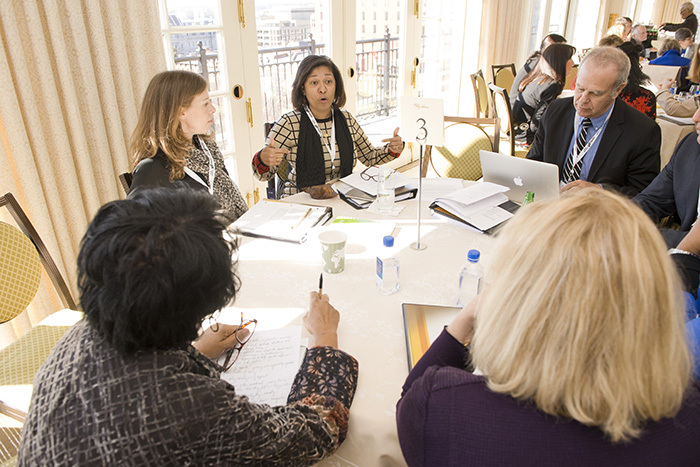 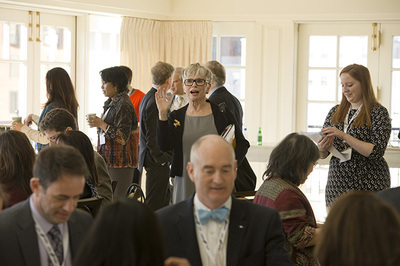 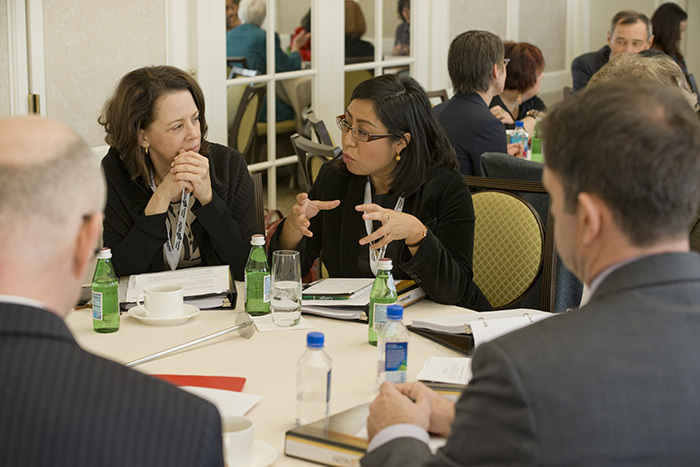 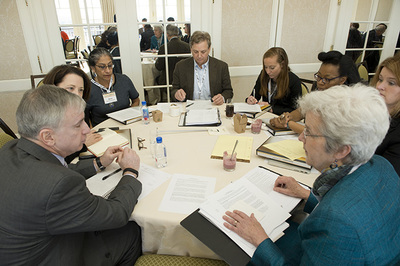 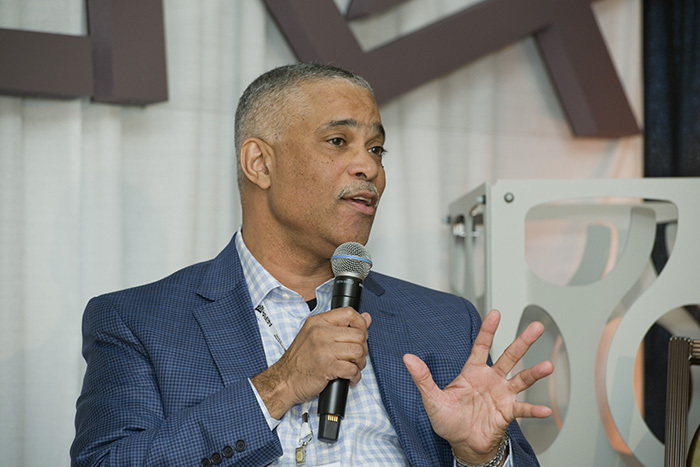 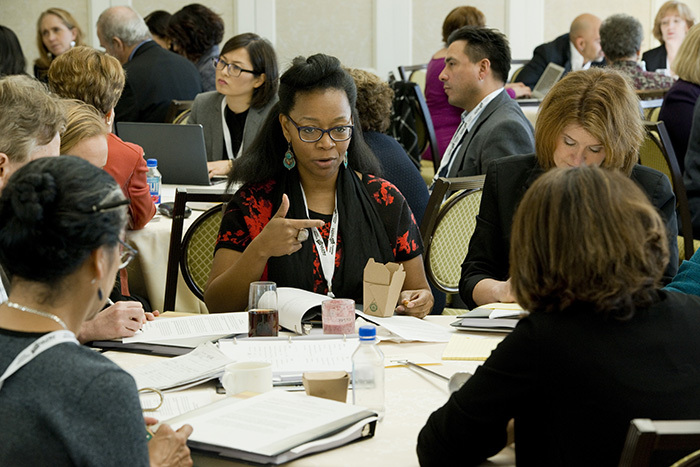 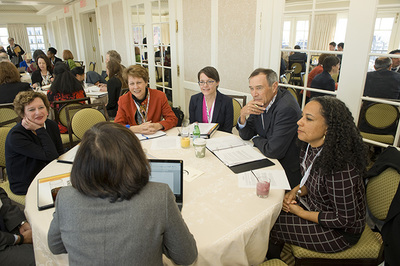 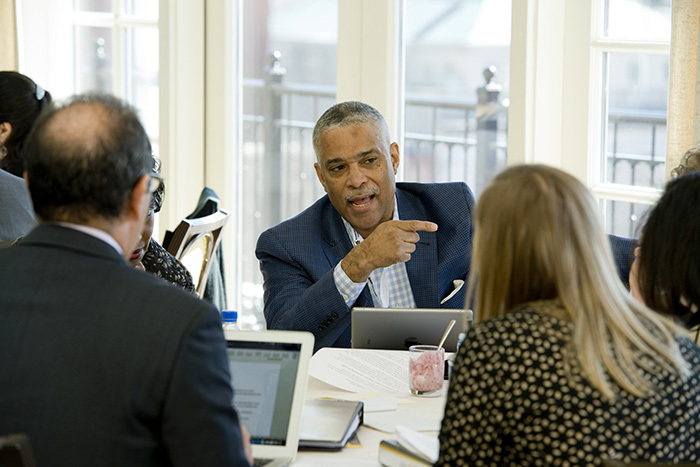 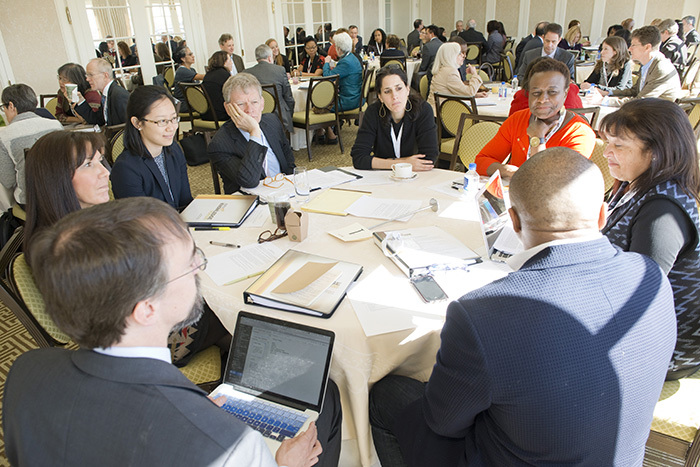 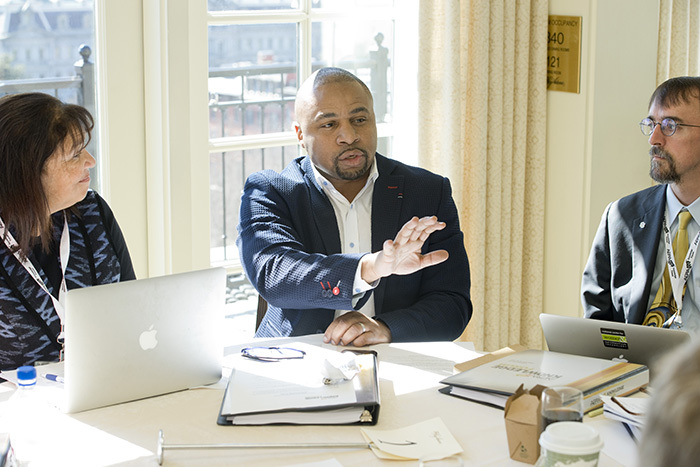 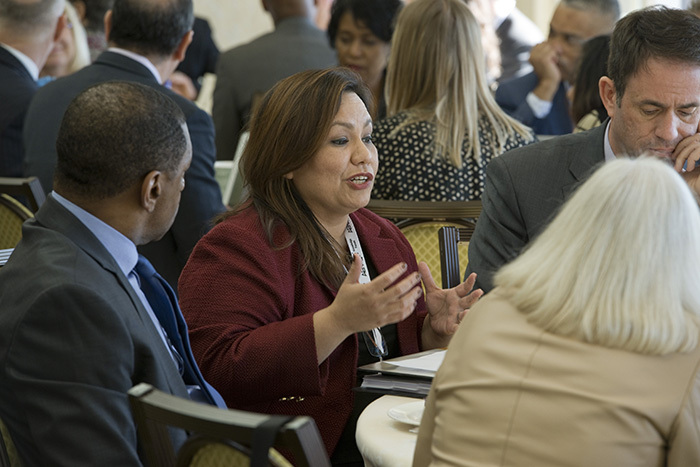 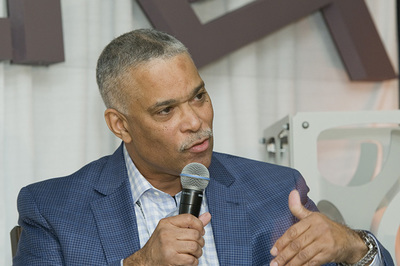 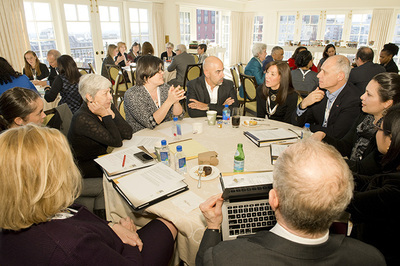 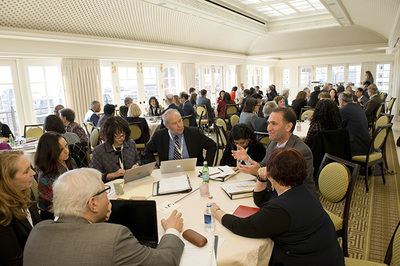 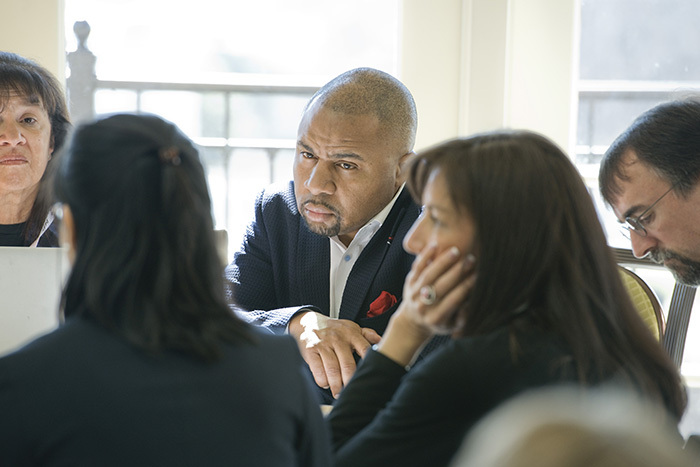 Each cluster was followed by in-depth small group discussions, led by six other scholars, partnered with thought leaders, to consider the position and potential of research from the vantage of thought leaders’ roles and need. 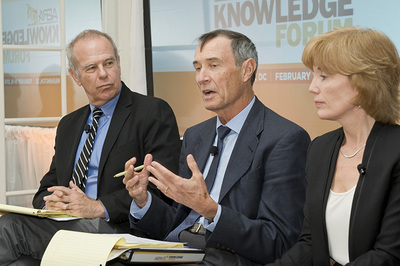 Kent McGuire (Southern Education Foundation) makes comments about the Forum. 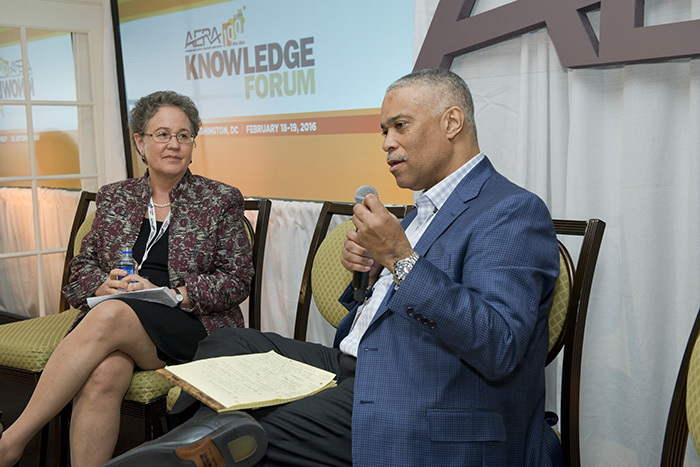 Linda Darling-Hammond (Stanford University) and Kent McGuire (Southern Education Foundation) make comments about the Forum. Linda Darling-Hammond (Stanford University) comments on the Forum. AERA Past President Jeannie Oakes addresses Forum attendees. 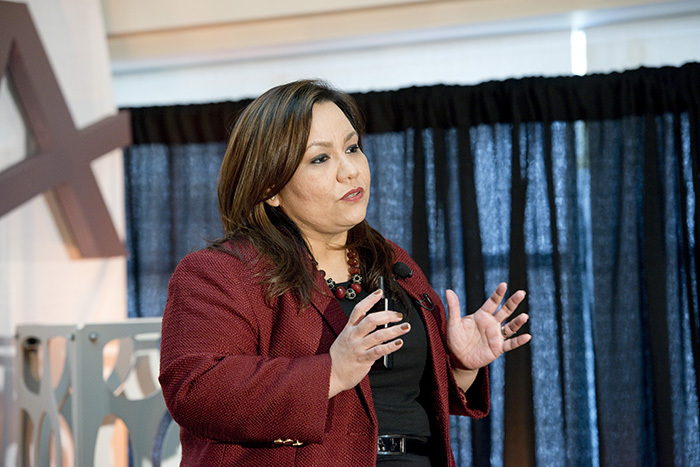 Stella Flores (New York University) addresses Forum panelists. 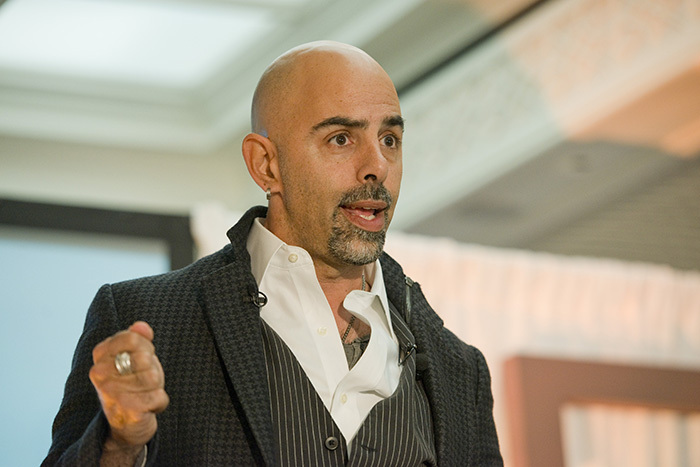 Thought Leader asks a question during the Forum. 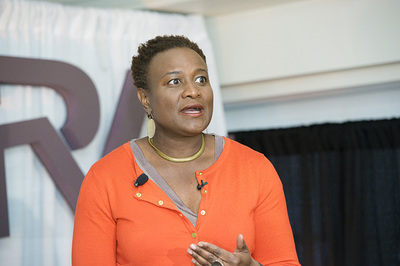 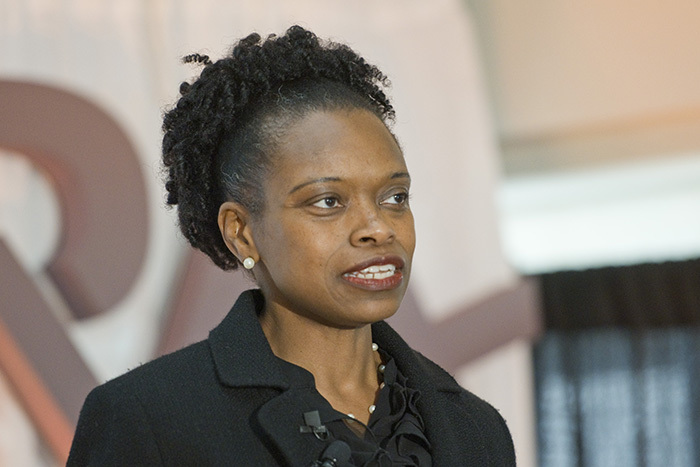 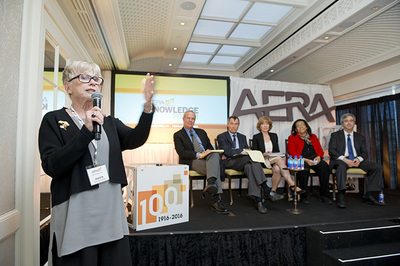 Shirley Malcom (American Association for the Advancement of Science) addresses Forum attendees. 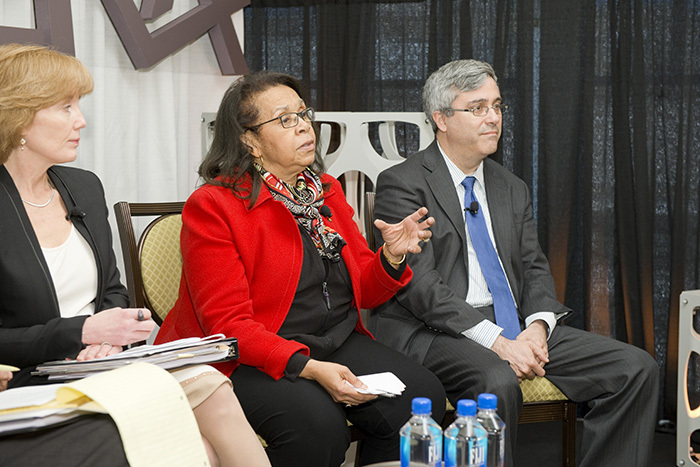 Patricia Alexander (University of Maryland - College Park) addresses Forum panelists. 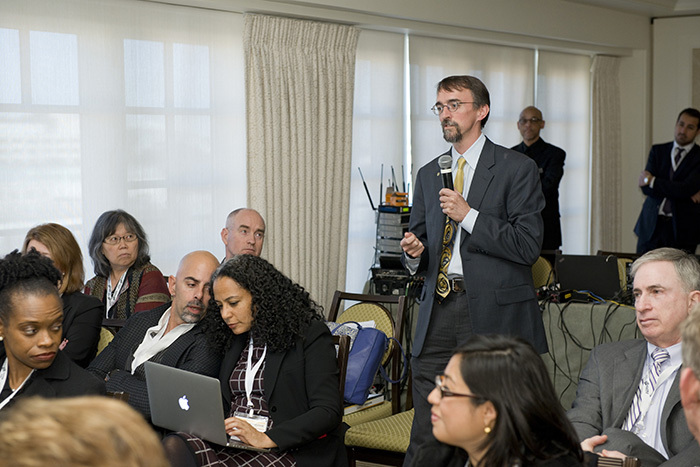 William Penuel (University of Colorado Boulder) chimes in during the Forum. 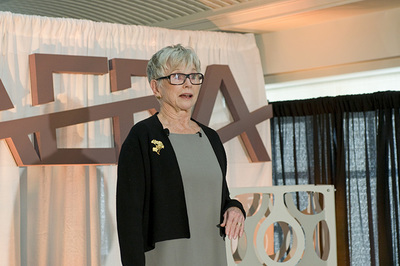 Dorothy Espelage (University of Illinois - Urbana-Champaign) delivers her Ed-Talk. Howard Stevenson (University of Pennsylvania) delivers his Ed-Talk. 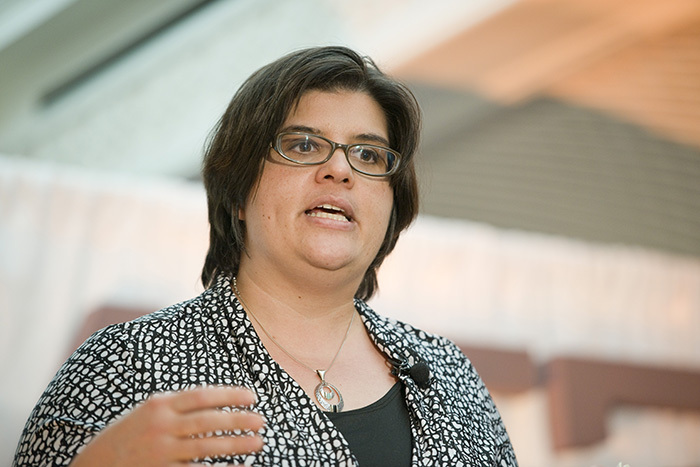 Chandra Muller (University of Texas - Austin) delivers her Ed-Talk. 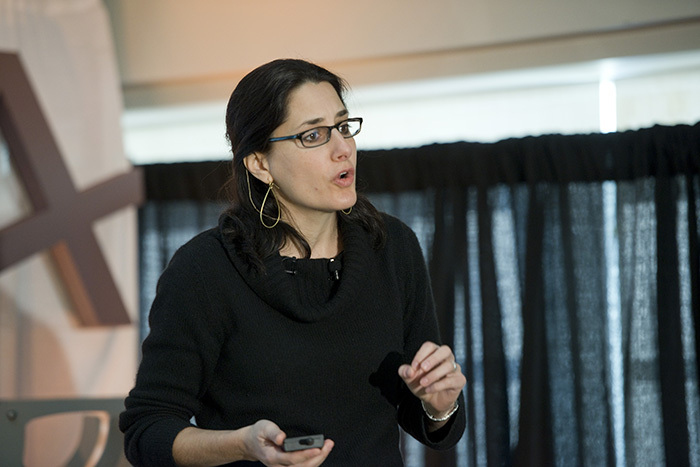 Megan Franke (University of California - Los Angeles) delivers her Ed-Talk. 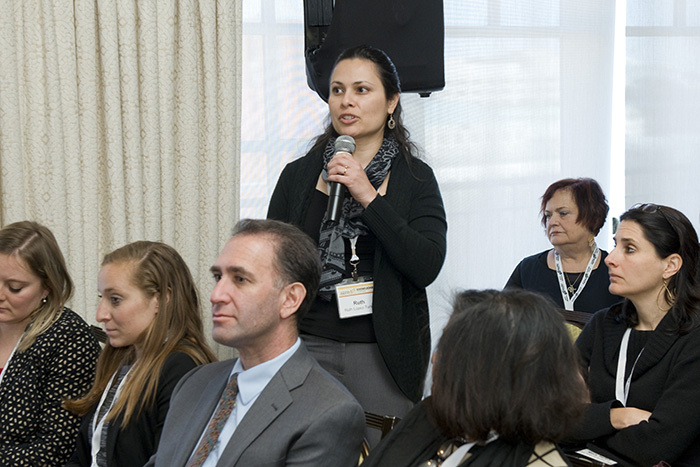 Michelle Renée Valladares (University of Colorado - Boulder) introduces the "How Can We Optimize Learning?" 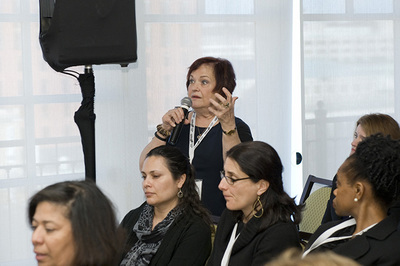 ED-Talks. 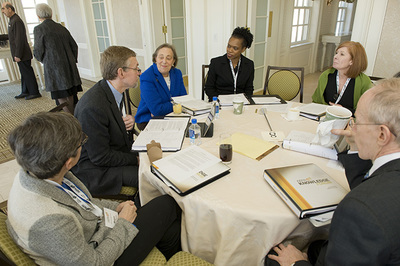 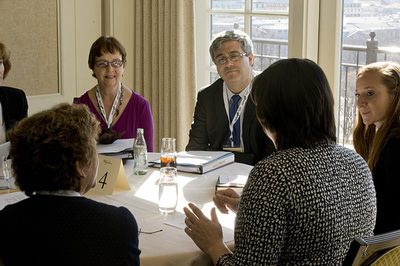 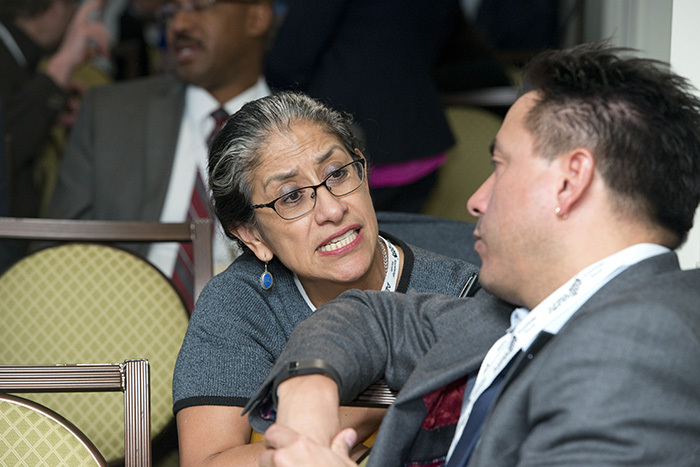 Attendees hold discussions within their breakout groups. 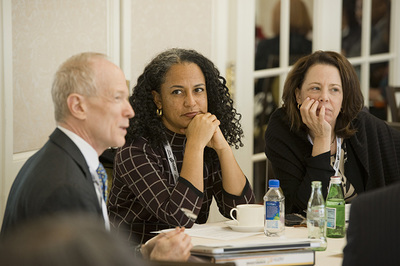 Steven Barnett (Rutgers University) speaks as Na'ilah Suad Nasir (University of California - Berkeley) listens in. 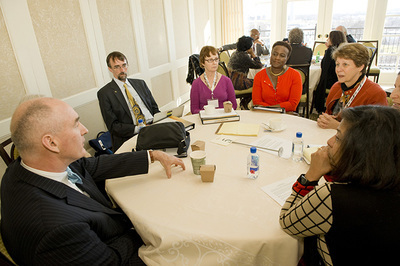 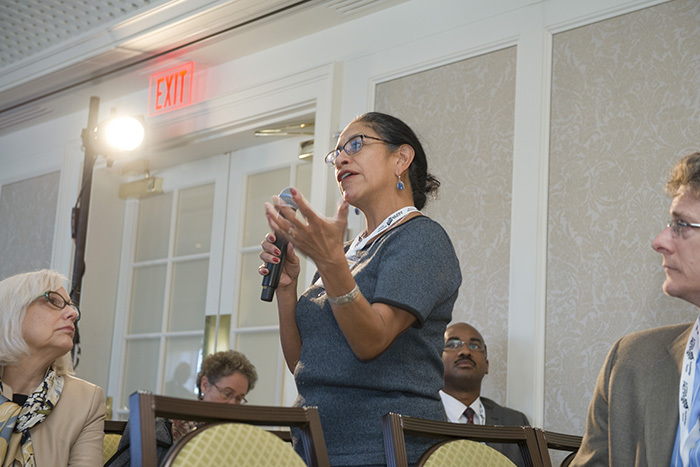 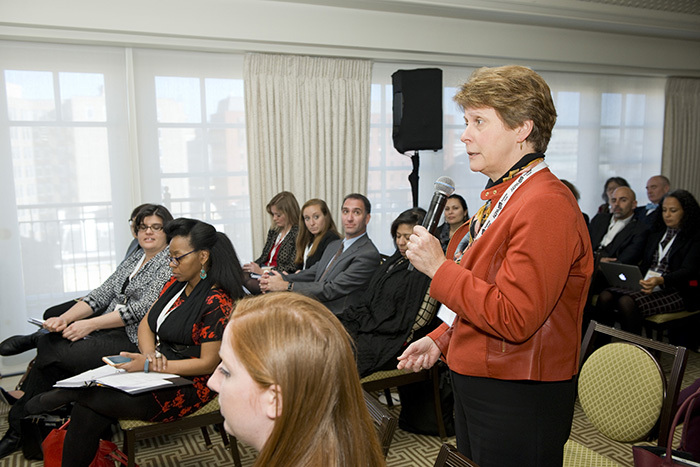 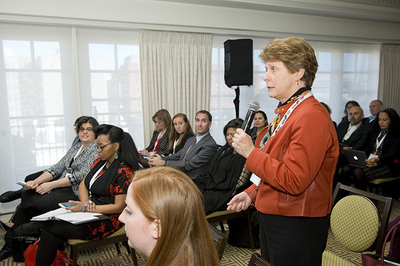 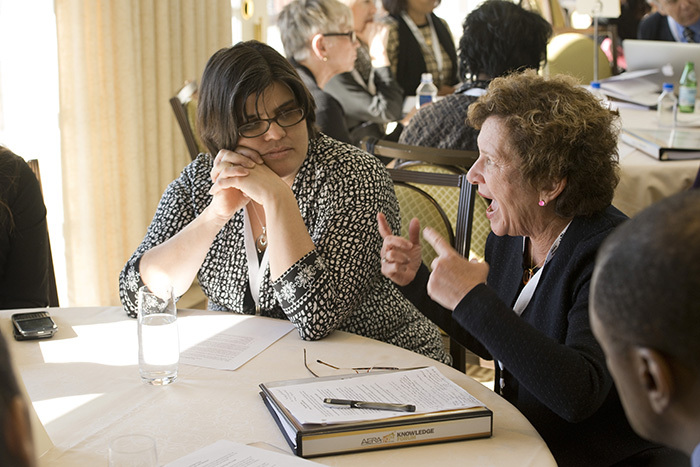 Patricia Alexander (University of Maryland - College Park) raises a point in her breakout group. 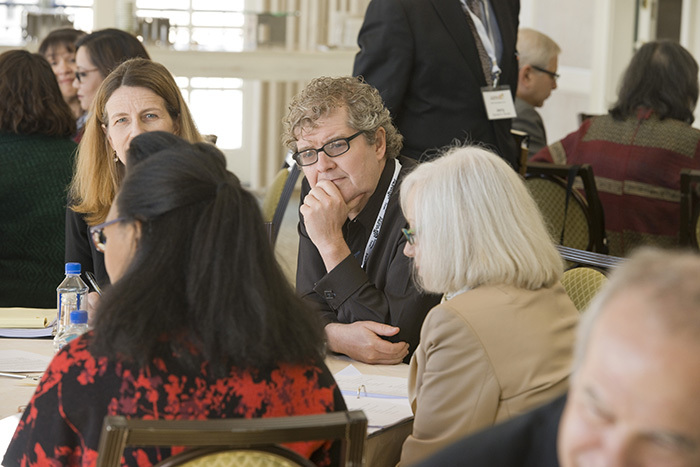 Sean Reardon (Stanford University) listens in on his breakout group's discussion. 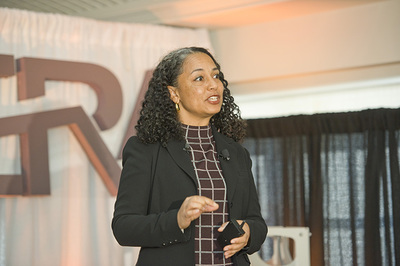 Na'ilah Suad Nasir (University of California - Berkeley) delivers her Ed-Talk. 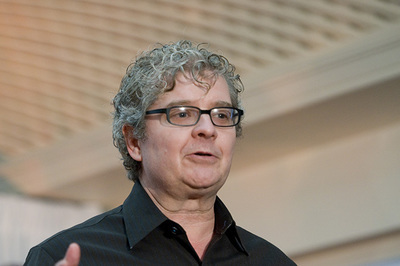 Sasha Barab (Arizona State University) delivers his Ed-Talk. Patricia Alexander (University of Maryland - College Park) delivers her Ed-Talk. 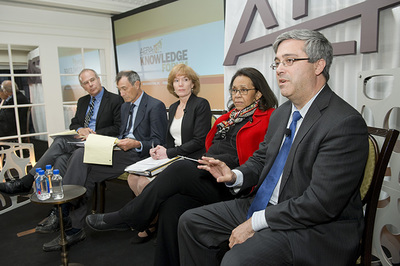 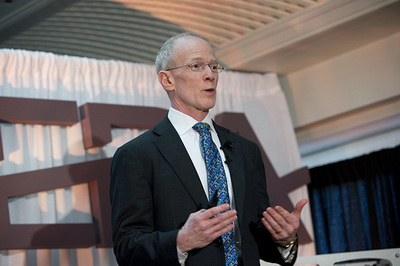 Kent McGuire (Southern Education Foundation) addresses Forum attendees. Roberto J. Rodriguez (Deputy Assistant to the President for Education) and Kent McGuire (Southern Education Foundation) addresses attendees. 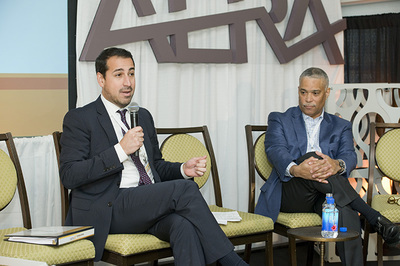 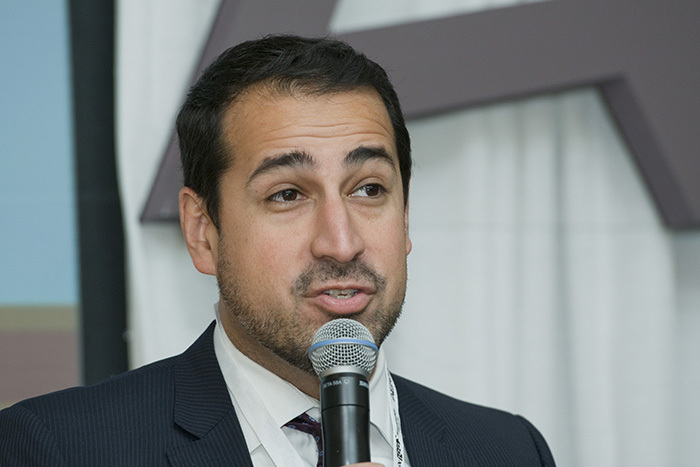 Roberto J. Rodriguez (Deputy Assistant to the President for Education) addresses Forum attendees. 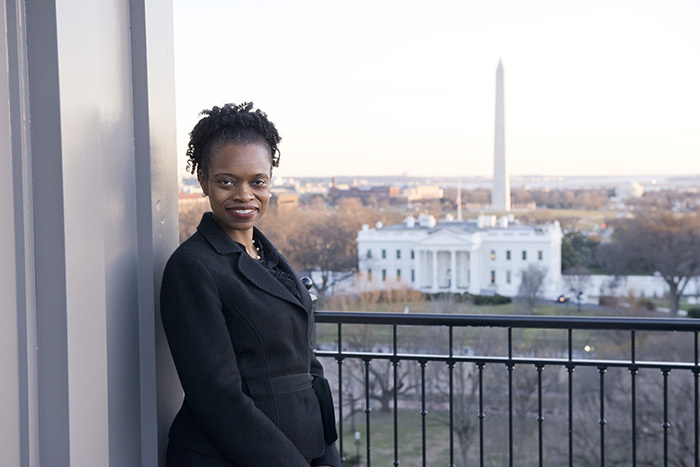 Lori D. Hill poses for a picture with the White House and National Monument. 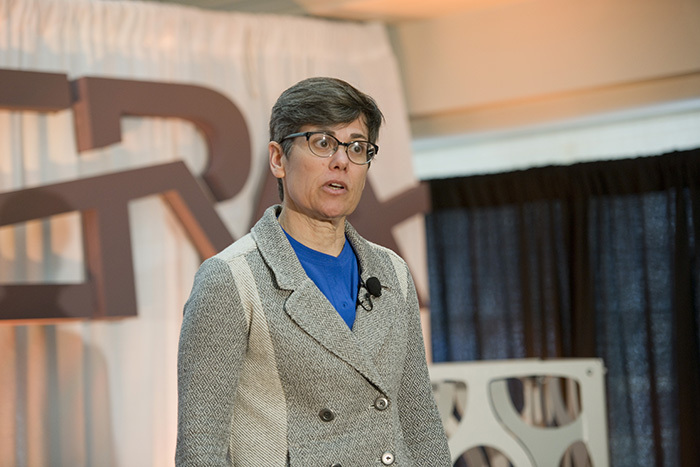 Mary Helen Immordino-Yang delivers her Ed-Talk. Lori D. Hill addresses Forum attendees. 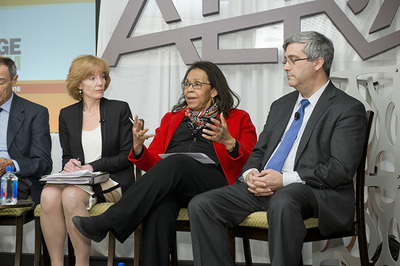 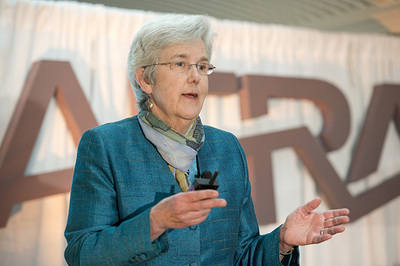 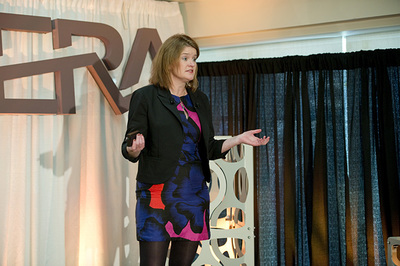 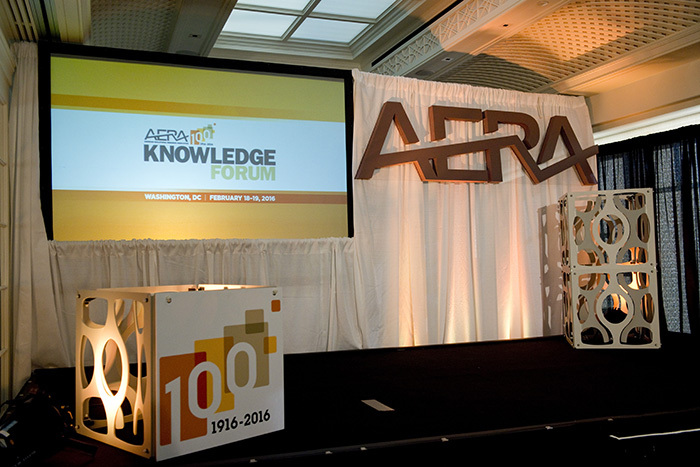 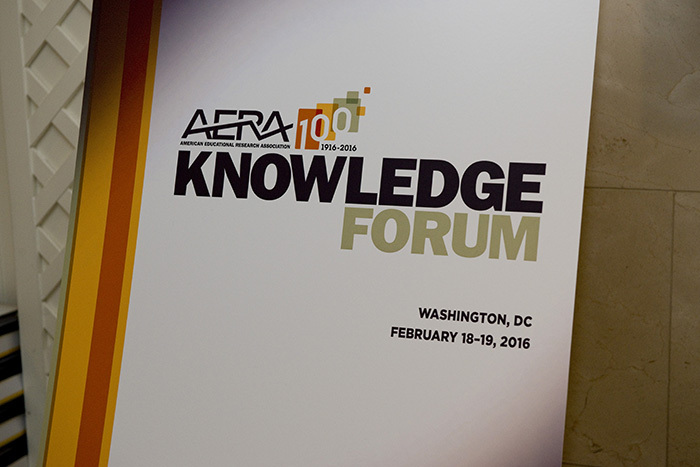 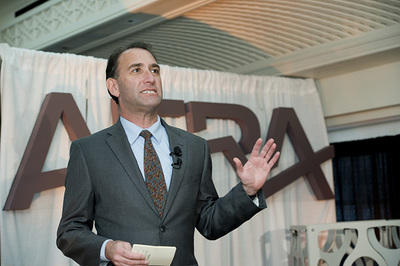 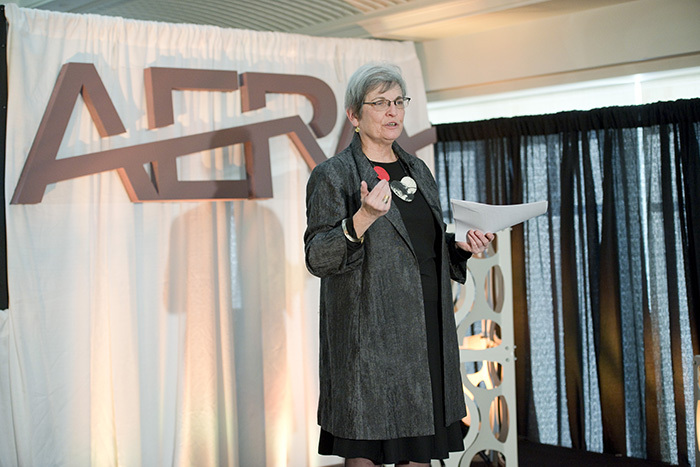 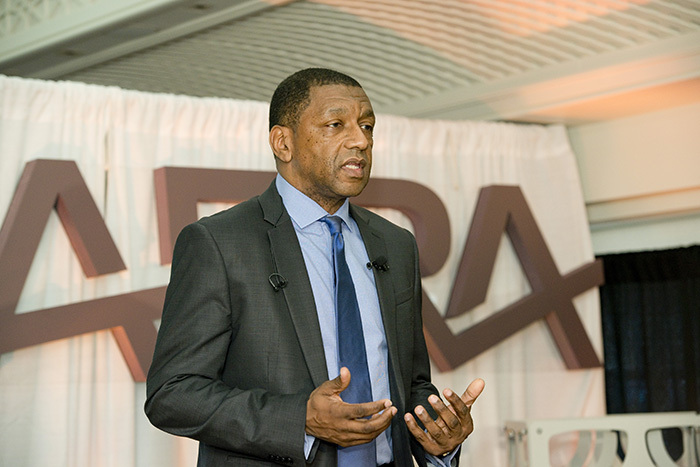 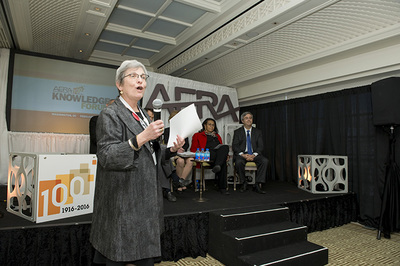 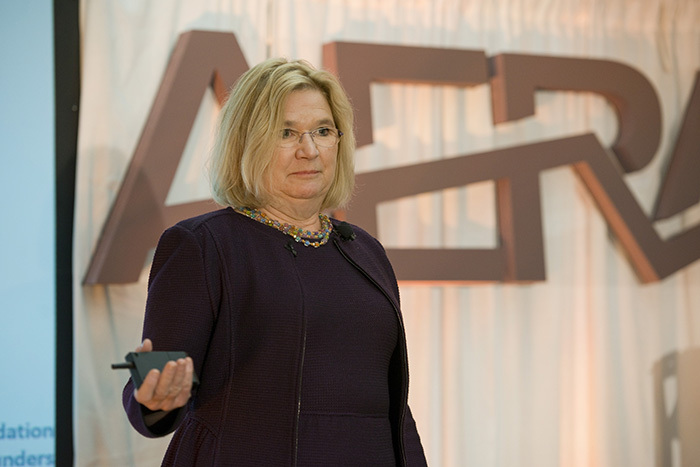 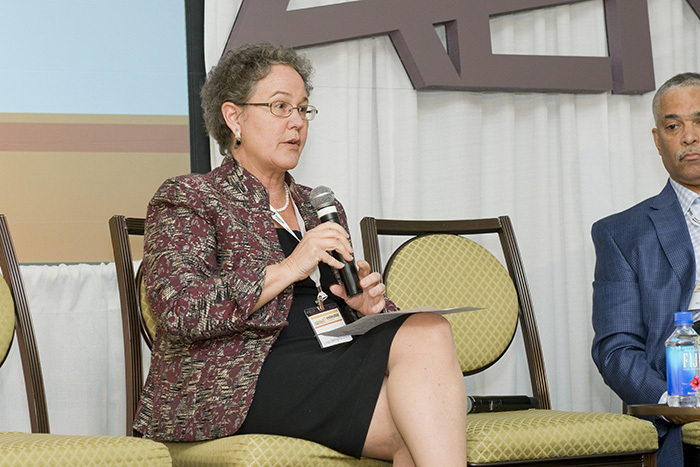 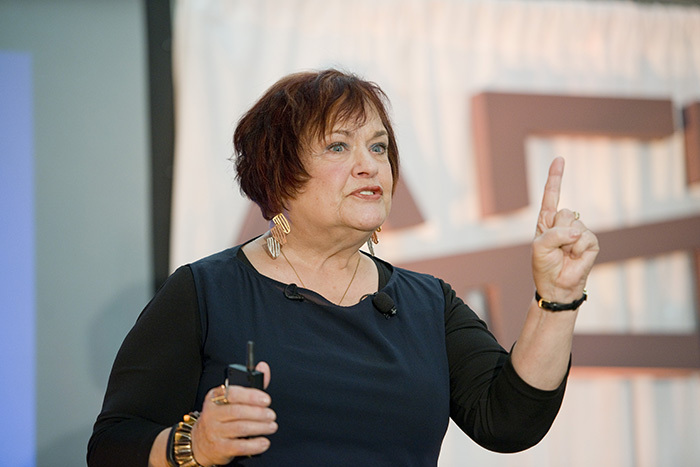 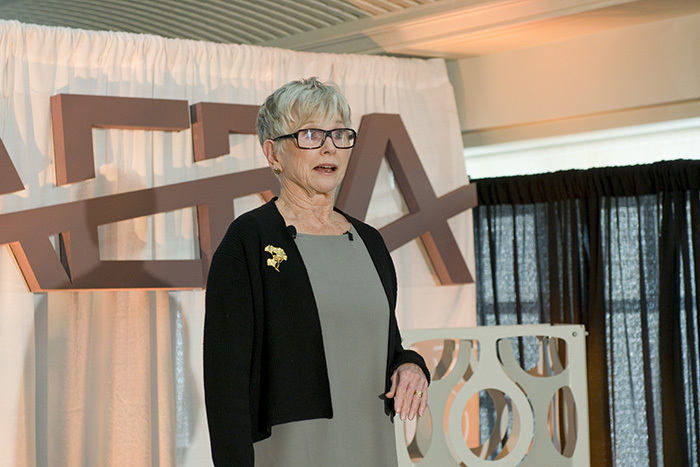 AERA Executive Director Felice J. Levine addresses Forum attendees.